Here are some photos of Cleopatra and Lexus, the most beautiful, wonderful, kindest, calmest, good natured cats in the entire world. I love them so much and I am so happy to have found Mi Cattery. 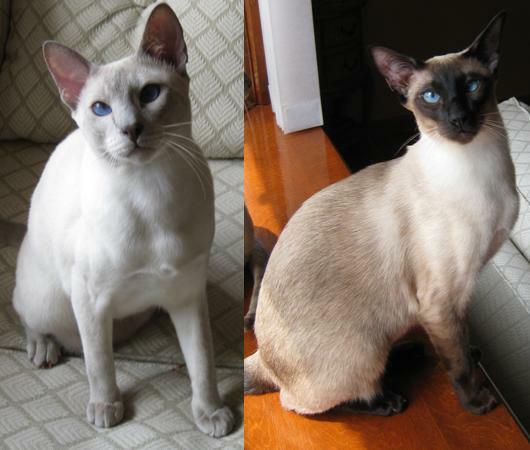 The most amazing thing about then is that everyone including my vet says that they have never met more calm, even tempered Siamese. Cleopatra is a very vocal little boss lady and Lexus wants to give and receive kisses all day. He even puts his paws on your face so that he can pat you with them and then give you kisses. Neither of them scratch people and I don’t even clip their claws. Yes, he's a member of the family already and is a big mush-pie. A very sweet kitty :) need I say more? It’s been a long time since I bought my two babies from you. 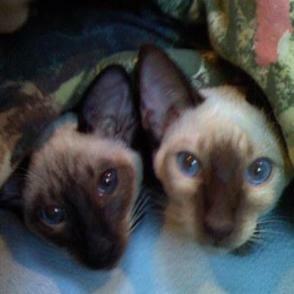 They have since grown into beautiful strong and healthy cats. The boy, Dr. Wundt named after the father of experimental psychology is so smart. He can get into closed doors, cabinets etc. And can he talk! He talks to me constantly. Munki, the female, is aptly named because she is the tiniest and most agile sweetie in the world. There is no door ledge, wall, bookshelf, or curtain she cannot scale. I find her in the highest points in the house or between my legs endlessly playing just as a little monkey would. They meet me at the door, when I come home, follow me to the door when I leave and fill my heart with as much joy and love as I imagine someone’s most precious first born infant would. I am so glad that I purchased my cats from you. 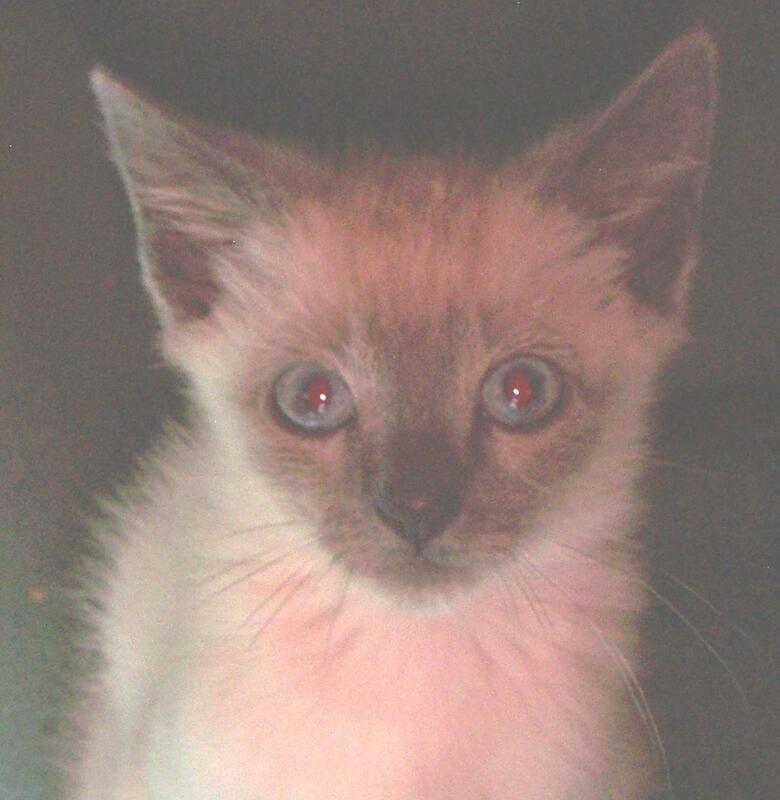 I purchased a Siamese kitten from you in Nov 2008, I called her Peanut. Peanut is amazing!! Very affectionate, playful and absolutely gorgeous. Every visit to the vet is like a Peanut admiration session, everyone loves her. Her latest trick is to hide behind the arches in each of my rooms and wait for me to pass, she then jumps out and clings to my leg and then runs off at great speed. My favorite thing about Peanut is that in the mornings she climbs up onto my bed and if I am not awake she taps me on the head until I wake up, then she curls up beside me until I get up. If i take too long to get up, she will flick her tail against my face until I get up, very cheeky!!!! I have never had a cat before and I must say this is the best first experience that I could have had, I can't remember what it was like before the "nutty one" as i call her - she is a pleasure and so much fun! I wanted to send you a more recent picture of Romeo (taken a few weeks ago). My wife passed away about a year and a half ago, I cannot imagine what that period of time would have been like without Romeo as my constant companion and housemate. 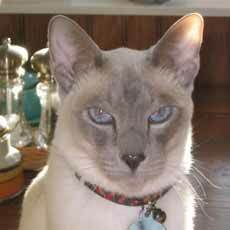 He continues to be the most affectionate, intelligent and friendly Siamese cat I have ever had. 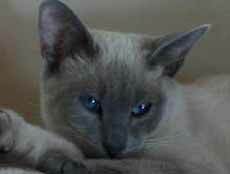 It has been a month since we got our Blue Point Siamese from you, which we have named Roscoe C. Pudgikin. He has grown so much and has made our home warm again. He makes us laugh with his activities and is so intelligent. He is very vocal and loving which is what we were looking for. Samantha and Cocoa have been absolute "angels". Much to my surprise, Cocoa is the kitten who causes the most trouble. She wakes me at dawn while Samantha likes to sleep late. They both get along beautifully with my two dogs often climbing on top of Bailey to take a nap. I have never heard a hiss out of either of them. Samantha brings me a shoe lace when she wants to play. Cocoa will climb on top of the kitchen cabinets. When they play together, it sounds like elephants running through the house! They are both a total joy to have in our home!!! We can't believe it's more than four years since we brought Teebo and Desi home and we've never regretted a moment. They have turned out to be loving, sweet companions with very quirky and entertaining personalities and very handsome too. Whenever the doorbell rings they both run to see who is coming to visit and give them the attention they deserve. Simon just loves belly scratches and Jasper is partial to head rubs - if they don't get what they want you are certainly sure to hear about it in no uncertain terms. 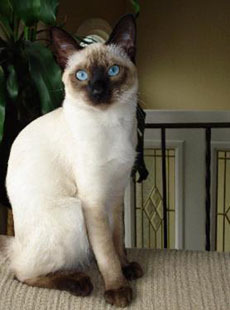 We would have no second thoughts about recommending you to anyone who would want to be owned by a beautiful Siamese cat (or two). You certainly are the best and most caring breeder in my book. We are always thinking about how lucky we were to find you. Thought you would like to see ,Tara, the baby of your "Sweetclair" litter. You can see from her restful pose she is a 9 month old beauty. But don't be fooled by her placid appearance, for she is a live-wire of awesome proportions. 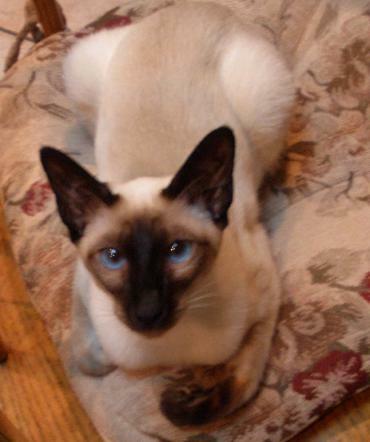 She retains a persistent curiosity about her surroundings and has re-energized our 10-year-old Siamese with her constant playful antics. 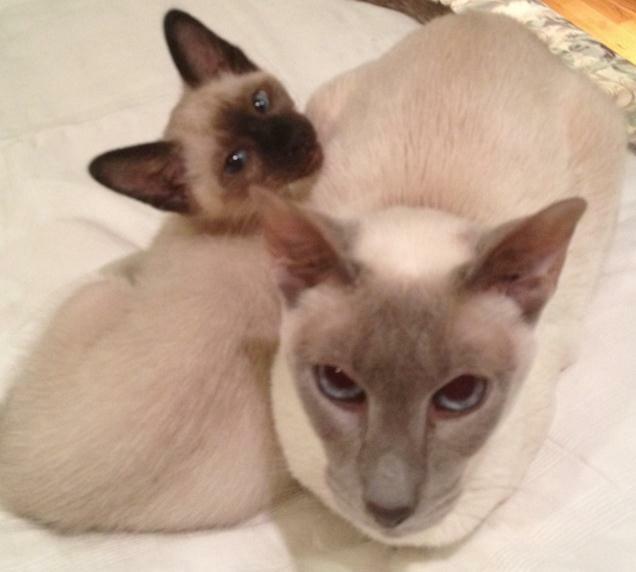 Lissa and I have been meaning to write to say how unbelievably happy we have been with our seal point kitten, who we've named Thai (her registered name is Mi Emilissa's Thais). What a great, great, great little cat! Every day she has been a joy. 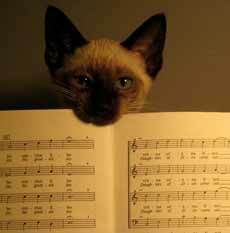 Many thanks for providing us with such an incredible, good natured kitten!